"Sh*t, the eggs are in the green bag." "You wait for ages then 500 turnip at once." "Yeh, they're full of grapes, can't stop, got a pressing engagement." I for one welcome our new overloads. The driver was given a suspension. "Are you a Mexican or a Mexican't?" The only claim to fame my son will ever have, is customs said he was the worst cannabis smuggler they had ever caught. "Oh no, mum's been to a car boot sale again." I’d been sacked fifteen times from different jobs before I got the job as a taxi driver. 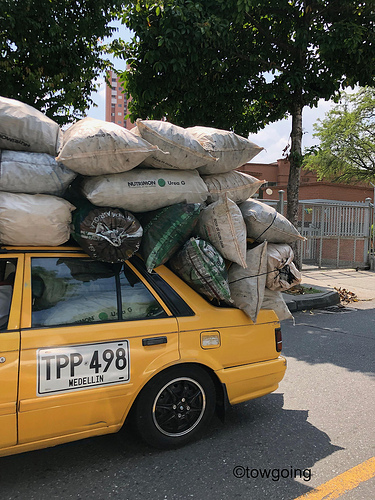 Big weight for a taxi. "I said we need to carJACK a vehicle for the getaway!" They keep giving him the sack but he has plenty of drive. There's bags of room in the back. "You've got to be kidding me, a dead end. I wish this car had a reverse cam"